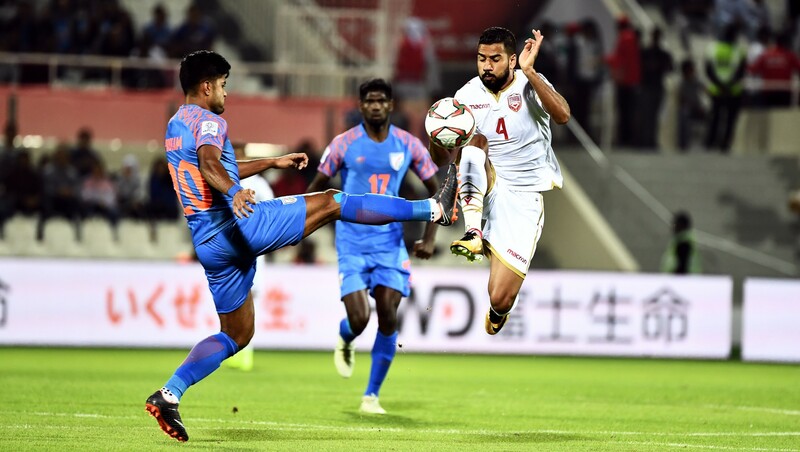 Indian football team lost 0-1 to Bahrain in its final group game at the AFC Asian Cup 2019 on January 14. Here is a report card of the players from the match. 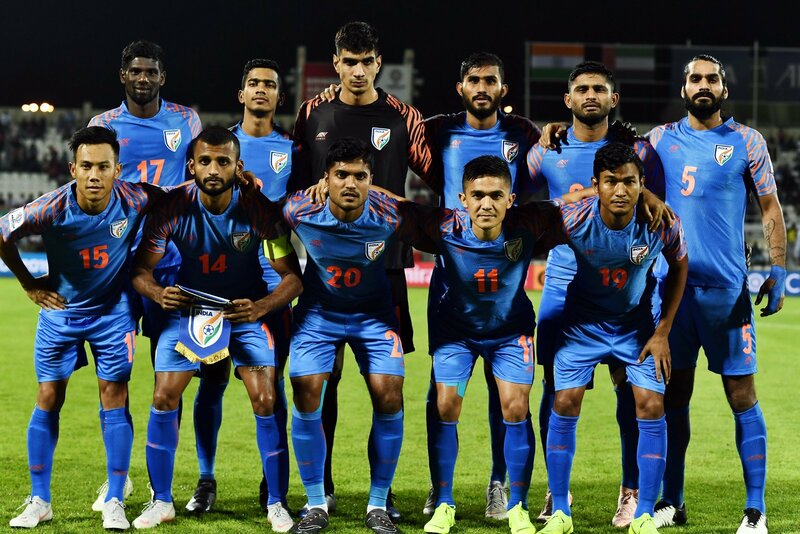 Indian football team playing XI, before the start of the match against Bahrain at the AFC Asian Cup 2019 in Sharjah (pic: AIFF). We would’ve given him full marks if he had held on to that final grounded ball from the left. If he had held on, India might have held on. But Gurpreet made some top saves and deserves all the praise coming his way. Solid effort from a wingback who will be a part of India’s football setup for some time to come. Was collected and composed for the most part. Can do better with playing the ball into space, though. Particularly with guys like Halicharan and Ashique in front of him. Subhashish Bose of Indian football team in action against Bahrain at the AFC Asian Cup 2019. Didn’t make a mistake all game. His best game of the tournament. Was superb in terms of positioning, a solid presence physically and showed great timing in the tackle. Subbed off due to injury in 2nd minutes of the game. Might seem a bit harsh but he made a couple of crucial errors and had a role to play in the penalty that India ended up conceding. A decent effort, though, from the East Bengal central defender. It’s not easy coming on for the first time at a crucial stage of a major tournament. Given Anas’ issues with injuries in the recent past it wouldn’t have hurt to put him in for a few minutes in either of the previous two games just to find his feet and get some mud on the boots. Dealt pretty well with the relentless Bahrain wing play on the right. Nothing spectacular but also no major errors. He is another player who has cemented his spot in the side. 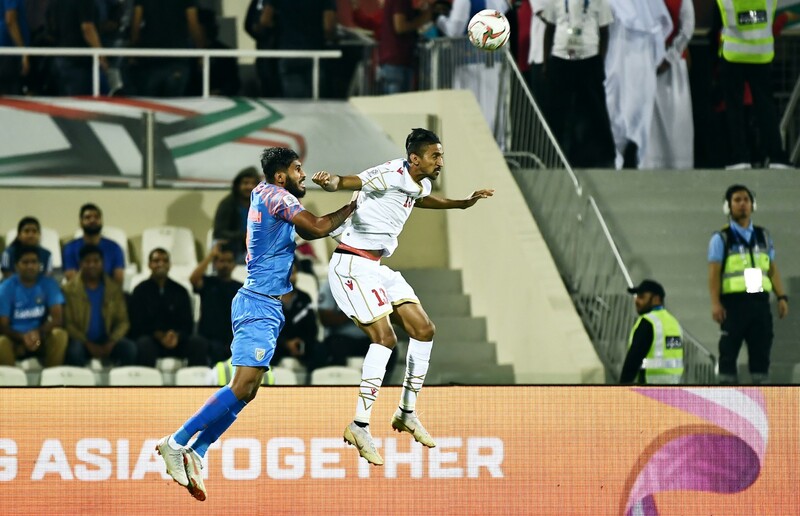 Pritam Kotal and Rowllin Borges (background) of Indian football team in action against Bahrain at the AFC Asian Cup 2019. The armband came to him today it was almost a perfect 10 for Pronay. His reading of the game and positioning was outstanding — evident from a high number of interceptions he made through the game. Right at the end, though, he ran out of the very last drop of gas in him. Tired legs led to a really desperate, terribly late challenge at the top of a box that was a clear penalty in the 2nd minute of stoppage time. Will need to do something really special next season to get back in the reckoning for India. Specially under a new coach. Borges looked out of place in the squad and was missing both physicality as well as pace. In the Bahrain game his passing was completely off as well resulting in several poor attempts to find teammates that resulted in gifting away what little possession India had. The Subhashish Bose-Halicharan Narzary combo on the left worked well for India at the Asian Cup. The duo were able to link up well, create an outlet for attacking play and also conscious of their defensive duties. Narzary continued his development, showing improvements in most aspects of the game. He is the only wing player whose appears competent at crossing, an element missing from the flanks otherwise. Thapa was brought on in the 79th minute to replace Narzary. Did not have enough time to make any sort of impact, though. It was surprising to see Borges kept on the pitch for the duration even though he looked the most out of sorts. Udanta’s speed and strength on the ball are two aspects we have spoken about in the past and are the most apparent. But another area he has worked hard on is getting back behind the ball and helping out on the defensive side of things. Very important in the context of the national team. Udanta was India’s best player against the UAE and continued in the same form against Bahrain. The young Manipuri winger has grown tremendously as a player and should continue to be seen in India colours for many years. Still can’t cross a ball, though. Constantine’s masterstroke in India’s opener against Thailand was to play Ashique up front along with Chhetri. It was a smart move that added teeth to India’s attack and the Thais were completely taken by surprise on account of the pace and intelligence with which the Indian front line played. Had an indifferent game against a strong UAE lineup and was taken off at half time in the final group game. In the first half Ashique showed willingness to hold and carry the ball, take on defender and play some nice one-twos with his compatriots. This resulted in 41 percent possession for India after the first half — the most they kept the ball all tournament. With him off India looked to have closed off their only attacking plan — to hit Bahrain with speed and precision on the counter. With the outlet clogged India sat all the way back and tried to withstand pressure for the full 45. We know what happened next. Bringing Jeje on was a clear indication that Constantine wanted to slow the game down further and put his eggs in the draw basket. The hope was that Jeje will be able to hold the ball in the opposition’s half, give the rest of the boys a chance to recover and, maybe, win some freekicks in good positions. Jeje started well, but soon disappeared from sight entirely. A poor outing for another player who will have a tough time getting another India call up. Chhetri had the opportunity to make a real difference against the UAE but didn’t have his best game. It was much of the same vs. Bahrain. Though still the most intelligent Indian player on the pitch Chhetri wasn’t able to make the impact that is required of him in the national team’s context. 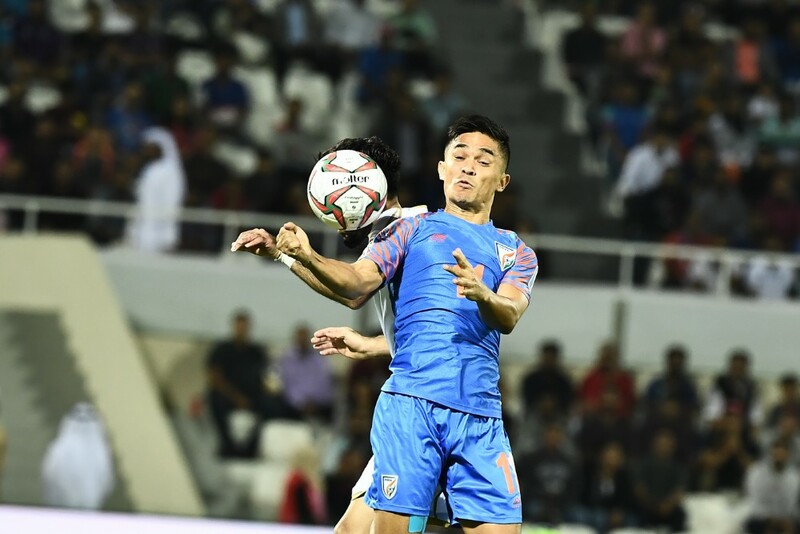 Sunil Chhetri of Indian football team during the match against Bahrain at the AFC Asian Cup 2019. He had one half-chance, in the first 45, where he could have let loose a left-footed strike and at least tested the Bahraini keeper. Decided instead to take another touch and create a better angle, but his feet were just not quick enough for the defence to buy the fake. Chhetri will be bitterly disappointed with how his tournament ended, after such a bright start. In what was most likely his final game for India at a major tournament, Chhetri would’ve wanted to make more of an impact. But it wasn’t to be. The coach’s tournament also ended the same way Chhetri’s did. Starting with Borges in the centre of midfield, instead of a rapidly developing and very solid Anirudh Thapa, was the first sign that Constantine had misplaced confidence in being able to hold Bahrain goalless. That he kept Borges on for the duration was impossible to fathom. It didn’t end there. When we were assessing Constantine’s squad for the Asian Cup we had specifically discussed Anas’ injury issues this season and felt it was a good call to have Subhashish and Narayan Das in the fray. In case of an injury, we assumed, Bose could move to central defence and Das has plenty of experience (including 29 caps) as left back. Instead of making this change, though, Constantine decided to play Salam Ranjan- who has not won too much playing time at the international level. Though Salam did okay, the applecart was upset. At half time he chose to take Ashique — India’s most positive player against Bahrain — off and replace him with Jeje in another confounding move. Overall, he seems to have read the game poorly and, perhaps, preempted the inevitable by announcing his decision to leave India in the post match press conference.